BG introduces new BG Hybrid Performance Service | BG Products, Inc.
WICHITA, Kan – Hybrids need maintenance just like every other vehicle with an internal combustion engine. Today’s combustion engines are prone to early carbon buildup. Drivers with twin-powered hybrid electric vehicles (HEV) should preserve the power and performance of their traditional engine just as they would an all gasoline powered vehicle. 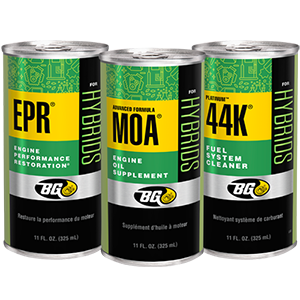 BG Products announces the all-new BG Hybrid Performance Service, which removes carbon from the entire HEV fuel system and engine. “The BG Hybrid Performance Service is the premier preventive maintenance solution for a quickly growing global alternative vehicles segment,” said Tim Allbritten, Senior Business Development Manager. Without proper maintenance, HEVs have an expiration date on more power, better fuel efficiency and lower emissions. At their best, HEVs are remarkably efficient vehicles. But to keep them at their best, they require a high performance solution you won’t find on the shelf. Ask your Service Professional about how a BG Hybrid Performance Service every 10,000 miles (16,000 km) can preserve the performance of your hybrid. 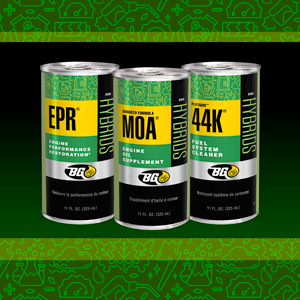 BG Products’ mission is to make sure all vehicle owners know the importance of automotive maintenance. The reliability of your vehicle is important. To us, preventive maintenance ensures reliability. That’s why we offer the best preventive maintenance services. You can trust that when you ask for BG products at your local repair shop, you’re asking for more than routine maintenance. You’re asking for peace of mind in long-term performance and reliability.